Start a Successful Blog Today!! How much time do you spend on the internet, and what gadgets do you mostly use? By 2016, for the first time, mobile internet usage surpassed the desktop usage, and the trend is still on the rise. Studies have it that mobile usage accounts for 65% of the digital consumption, and you can imagine how fast the trend is growing. Quick Response codes – Commonly known as QR codes, these codes help customers to use their phones to scan products and instantly receive details about your company. SMS – This is a prevalent and active mode of mobile marketing. It is also easy to use as the customer only needs to opt-in and start receiving your coupons and promotions on her mobile devices. However, ensure you send text messages to the list of subscribed users to avoid violating their privacy. MMS – Just like an SMS, these are easy to use and are even better since they make use of videos, images, and audios. They are not only attractive to users but also create memories and can be easily understood. Apps – Mobile apps allow you to advertise your offers to the mobile user. The customers can download your app through which they will know about the latest details from your company and can even use the app to purchase your services. Definitely consider hiring one of the many app development companies out there to build you an app, as it will significantly enhance your connection with your customers. In-game marketing – When playing a game using your tablet or smartphone, more often than not an ad will pop in. Advertisers pay the game owner to have their products featured in the game. Mobile marketing involves reaching out to specific audiences through their smart devices such as smartphones and tablets. It allows you to advertise your products or services to your target groups through MMS, SMS, emails, social media apps, games, and websites. As such, your clients or prospects do not have to get a desktop to know about your current offers, but merely use handheld gadgets. 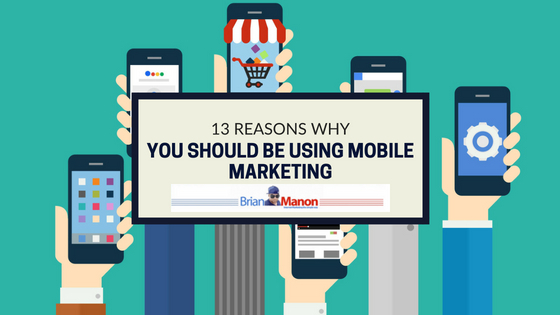 Here are the top 13 reasons as to why you should be using mobile marketing. Instant delivery – In this era, everyone carries smartphones along with them. This is why marketers are guaranteed instant results since people will receive the message immediately or once they switch on devices. This beats traditional marketing techniques such as email marketing where one must login to the service to read the message. Availability – Today, almost everyone is reachable through mobile phone all the time because people do not want to miss communicating with family, friends, and coworkers. This is to the advantage of marketers as they can always reach out to their audience via mobile devices. Privacy – Unlike laptops and desktops that can be comfortably shared, most people value the privacy of their handheld gadgets. Due to this, a business can share details with the mobile user that will remain privy to the user and the marketer. On the other hand, because the user knows their device is private and intimate, she will be free to interact with the marketer and provide information that can be of use to the business. Informality – It’s never that serious, or is it? The casualness that comes with mobile messages is a thing to cherish. After all, who wants to receive constantly long emails with a frightening tone? When users get somewhat informal messages, they find them easier to relate and even respond compared to formal newsletters received through email. Going viral – Given that most people already own mobile phones, it is straightforward to have your campaign go viral. One user can receive a simple SMS or email, and then quickly spread it on social networks. Before you know it – everyone is talking about it! Budget – If you are operating on a constrained marketing budget, mobile marketing is the way to go. It is cheap and effective compared to traditional means that could involve printing materials or advertising on broadcast media. It is also more comfortable for the marketer to design and prepare the mobile content than desktop content. Personalized interaction – This is made possible by the fact that every user has a unique identification number as well as a mobile number. Instead of forwarding a generic message to all your contacts, marketers can now send a message directed to a particular person and the recipient does not have to feel like it is just another forwarded text. When a user receives a message addressing her by name, she feels more obliged to respond to such personalized text. The marketer is, therefore, able to get instant feedback by indulging the user directly. Portability – Users are always carrying phones and sometimes tablets too. Due to this mobility, they can receive notifications regardless of whether they are travelling or on vacation. Even if they do not use the collected information instantly, they can still store it on their gadgets until needed. Convenience – Due to the small size of the screens of tablets and phones, there is a limit on the amount of content that can be displayed. This is to the advantage of the marketer as well as the user, because the marketer will only be required to make essential and straightforward content, whereas the user will not spend much time going through the material. Wide coverage – Mobile marketing reaches a broader audience as nowadays, more people prefer using mobile devices over desktop/laptop. Furthermore, even those who reside in the world’s remotest places can still receive SMS, unlike areas without internet coverage. Mobile payment – This is another great benefit of mobile marketing. The convenience that comes with mobile payment is one of a kind and one that entices users to purchase. Take for example a user who comes across an ad about your products while playing a game, and she feels enticed to make a purchase. But then, she must show up in person to buy. The thought of having to show up physically to buy is enough to send someone away, whereas you can prevent this by making it possible for users to buy your products with a click of a button. Unsaturated niche – Mobile marketing is still relatively new and has more chances for growth. New developments in technology also stand a chance to be accommodated in the fast growing mobile marketing. No marketer can, therefore, say that the niche is already so much saturated that they cannot join and make progress. Messages will be read – Unlike message sent via email that is likely to end up in the spam folder, you are almost sure that a message sent directly as an MMS or SMS will be read. Also, people tend to delete messages in their email inboxes even before reading them, but are always eager to read messages received on their phones and tablets. Some years back, the internet was introduced to marketers and we took the advantage to boost their sales through online marketing. And just when we thought we had it all and that online marketing was the perfect deal, mobile marketing was born. This is the way every business is going now and you should not be left behind. Whether it is a small business or a multi level marketing, mobile marketing is the critical thing now. What else could you still be waiting for if you haven’t integrated it into your business? With Google turning to mobile-first indexing, which involves ranking sites using the mobile version of the webpage, it is crystal clear that the future of mobile marketing is promising. And although humans are innovative beings and you can never be sure of what other technology will follow next, mobile marketing remains to be the hottest deal until the birth of the next better deal.